Whether you’re hosting or attending an event, your needs are the same. You want an enjoyable, hassle-free experience. And that’s just what the South Towne Exposition Center offers. The biggest difference between the South Towne Exposition Center and other facilities is its unique location. 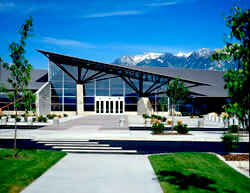 The South Towne Exposition Center was built in the heart of Salt Lake’s residential community. It is also located just off the freeway in the center of the Salt Lake Valley, providing easy access to visitors from Ogden to Provo. The South Towne Exposition Center’s emphasis on ease includes a lot more than just location. It offers complimentary on-site parking for hosts and guests, and large loading docks ensure getting in and out is never a problem. During events, everything is within your reach. Each hall has its own concessions, restrooms and show offices. No matter what your needs are, the South Towne Exposition Center’s central location and strict attention to convenience make hosting any event easier and more effective than ever. The South Towne Expo Center offers 1,600 free parking stalls. All parking is located on property in front of South Towne. The TRAX stop located across the street also makes attending events at South Towne even easier.